I keep thinking of stuff to write here throughout the day, then once I’m finally writing this post I forget what I was going to say. Oh, I remember now. Okay, so in Feb I got this 2 month project to work on, but seeing as its nearly April that means that project is finally finished! So I’m going to try to get back to two updates a week starting the second week of April. Isn’t that exciting? I wish I could have done that earlier but you know how it is with having to make the monies and eating and all that stuff. Anyways, hope you’re still enjoying the comic so far. I keep thinking the plot is going to get going soon, then I realize it is going (albeit very slowly. Like listening to one song stretched out over a few hours or something). Just to reiterate, please vote if you have a chance! We’re pretty solid at 12 right now but it never hurts to show solidarity XD And of course, theres stuff like the Facebook, the Twitter, and even the LJ (which needs some love T_T). Have a good weekend! Goodness, I hope Kiz isn’t waiting at the bottom of that tree. Your colors are pretty damn solid…. will there be more colorful interesting animals in the future? The center panel, where you can see that little bit of glitter in her eyes, is pure magic. ffffffffff her hair is painted so pretty. I’m jealous. great job can’t wait till next excited about the multi-weekly updates! I’m in love with her face in the second panel. Especially the eyes! So pretty. ;) And multi-weekly updates make me dance. hahahaha sweet_gardenias comment about kiz… ROFL! anyways, i like how this is going. it’s like we’re slowly getting to see what kind of a person angora is. aaand AND, more updates would be awesome! whatever works for you though. And I’m looking forward to moar updates too XD Snail-pacing has been getting on my nerves a lot lately. love her face in panels 2 and 4. This comic is awesome! When read all at once, I think your pacing would be perfect…but having to wait a week in between is madness! I get it, life and all that…but I’m still really excited for twice-a-week!!!!! The centre panel is stunning. I love how you draw eyes, they’re so expressive. Your faces, I love them. Not sure if I mentioned that to you yet. Great art, great comic!! It does seem to be going slowly but that’s just coz it’s a lil wait between updates, the pace is totally fine otherwise! It’s a good thing ppl are complaining (if they are) coz it means they like it and they want MORE!! XD Again I love your art style. Keep up the great work! SALAMANDER DON’T DO IT YOU STILL HAVE SO MUCH TO LIVE FOR…. WHHYYYYYYYYYYYY?! dude, great page. i love the color of that background man. awesome how you put the stars up top and fading down into the light. great job on that. and that second panel is very nice. beautiful expression on the second panel! Jeez, don’t fret so much about the pacing, girl. I just read the current pages in one go and they actually seem really fast paced that way (I think it has a lot to do with the fact that there’s a new character on every other page). Having lurked on this comic since you started doing the finished pages I’ve never thought it to be boring or slow either. For a non-strip-with-punchline-in-the-end type of webcomic this is about as good a pacing as you can get. Of course, if you can manage to make several pages a week it’d be great and you’d get through the story faster, but don’t worry about it too much. People are just being impatient. Thanks for being an inspiration by the way :) Me and a friend of mine are about to start a webcomic of our own and your way of storytelling kinda reminds me of my own – exept that you’re so much better than me of course. It’s great to have someone to look up to. Missed two weeks worth for swimming trips, came back, and thank you SAL-A-MANDER, Awesome comic, once a week is great, twice a week would be Super Special Awesome!, ,also watch as the salamander lands on Pinter, that little guy needs a name. Ha! Lovin the little salamander’s hop! Also, the super-close up of panel 2 in the incentive was totally sweet!! I know, it’s probably been said a million times, but, I can’t stop looking at the second pannel, It’s just so beautiful…Continue the great work AlexDS, and (as always) I can’t wait for the next page! I love this page, especially the close up. You can really see the distress and tension in her face. 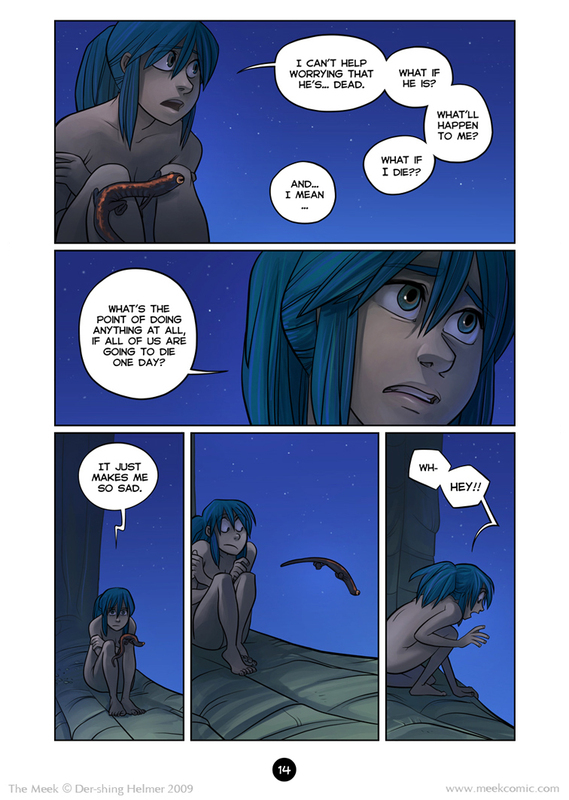 Man I hate web comics, I AM TO IMPATIENT AND EASILY EXCITABLE FOR THIS :(. Her expression in the second panel is SO lifelike. I expected tears to start pouring. Bravo. I’m glad to see I wasn’t the only person to survive Genetics by doodling in the margins. @new guy, no its not a sequel, though it starts out in the middle of current events in the world :) So it may be a bit jarring and confusing at first but it’ll clear up soon! If you want more info you can always check out the wiki linked in the “about” section! I’m new, so I just read pages 1 through 14 all together. You have nothing to worry about with pacing, you obviously have a talent for it. Each page works perfectly on its own, but all together the pacing’s still intact. I noticed you worrying about it in some of your comments, so I wanted to tell you that it’s actually coming out really finely crafted. You probably have an intuitive grasp of storytelling, which means A) You can’t necessarily tell how good you are at it, and B) You’re really good at it. Your art is gorgeous, and regardless of plot speed, your comic’s designed to hook readers from the first page. I guess I’m a new fan. That second-last panel really made me laugh for some reason. The combination of her startled face, and the leaping salamander. xD And the second panel is just gorgeous. Wonderful art.